Lord Krishna Idol Brass Hindu God Statue Religious radha Large India sculpture, HINDU GOD Child (makhan) KRISHNA Idol made of Brass Metal and its decorated with colorful stones. 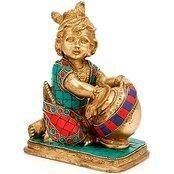 Lord Krishna - Makhan Krishna is a symbol of love,joy,devotion & music.Makhan Krishna, Antique/ Vintage Finish - Dimension : 7 Inches Height x 5 inches wide x 3 Inches depth weight :- 2.4 kg, Material :- Brass, this is made in Antique finish. Krishna is the eighth incarnation of Vishnu. He symbolizes truth, devotion, love and joy, Wedding Gift, Anniversary Gift, Birthday Gift , valentine Gift Decor.